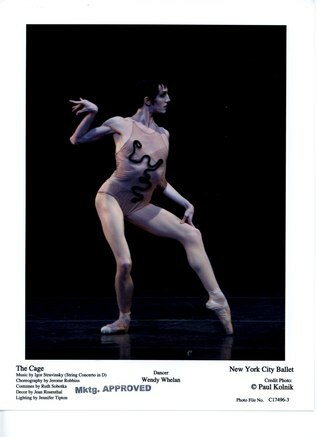 The evening program at the New York City Ballet on June 10, 2006 glowed with Balanchine and Robbins ballets from the 1950s, 1960s, and (just barely) 1970s. These are core ballets of the New York City Ballet, and they were seminal works for dance worldwide. George Balanchine choreographed Donizetti Variations to music from Don Giovanni in 1960. Andrew Veyette, just promoted to soloist this spring, and Yvonne Borree danced the lead couple. Because he is so athletic and because, frankly, the choreography showers opportunity on a confident man in this role, Mr. Veyette drew applause and praise again and again with his huge leaps, vertical and solidly landed tours, and on-tempo battement. Together they seemed unbeatable, Ms. Borree fearless in difficult lifts â€°Â¥Ã£ in several of which she leaps, turns, and is caught by the waist where she continues the gesture. They were wonderful. That Mr. Veyette, in the most dignified manner, acknowledged his applause with hand over heart but also grinned so very broadly only encouraged the audience to more applause. Six women (Faye Arthurs, Melissa Barak, Saskia Beskow, Glenn Kennan, Carrie Lee Riggins, and Elizabeth Walker) and three men (Craig Hall, Vincent Paradiso, and Aaron Severini) took on the patterning and the change-partners-and-dance small talk â€°Â¥Ã£ the Balanchine anecdotes â€°Â¥Ã£ enthusiastically. Craig Hall particularly excelled. Costume credits name Karinska. All the men's waistcoats have panels of umber, and from that earth-tone neutral, the designer drew out for the costumes elements of plum, rose, and carmine for the lead couple, and for the other dancers blue, lavender-blue, and for the women's tulle, even pale aqua. Every hue is related, each accents another, and the totality pleases immensely. Karinska is long-gone, but her deep understanding of color must still be marveled at. Jerome Robbins's The Cage, with music of Stravinsky and wonderfully arachnid costumes by Ruth Sobotka, was next on the program. This is a mid-century 'psychological' ballet about the "phenomenon of the female of the species considering the male as prey" (program notes). The set suggests a web, and 14 women, at once both spiderish and mantis-like, circle, then, platoon-like, pay obeisance to their Queen, Rebecca Krohn. A male, Adam Hendrickson, who seems attracted to the Queen, intrudes and is killed by her, with thumb-jabs to his ribs, and he is rolled offstage. Wendy Whelan, The Novice, appears to be emerging from a membrane as she is carried to the stage in a fetal curl and translucent veils are removed from her head and face. She is critically observed by the tribe. Her initial stretching, her spastic movements gradually become more controlled as vicious jabs into the air. They become pure threat. She is marvelous as a newly emergent voracious insect shedding its pupal case. Craig Hall enters and a strange duet ensues â€°Â¥Ã£ they are attracted to one another. Here is a strange bit of dance and an astounding bit of choreography: a combination of human-like balletic gesture at odds with the intensely insectoid angularity. The rest of the tribe enters and several grab the male intruder while tossing the Novice aside to the Queen. Each time the Novice tries to intervene and help him, she is hurled back. Finally, she kills him herself and returns to the Queen in obedience. To say this is an odd ballet is to understate, but it has been performed for half a century in all its oddity! Duo Concertant, choreographed by Balanchine to Stravinsky music, follows, with Darci Kistler and Nikolaj Hubbe dancing while musicians, pianist Susan Walters and violist Arturo Delmoni perform onstage. The dancers, standing side by side beside the grand piano, watch the musicians perform the first movement, and then dance the following movements, occasionally returning to the piano to listen quietly. The performance was brilliant, an attenuated pas de deux that seems, as interpretated by Ms. Kistler and Mr. Hubbe, a gentle romance. Lighting design (original design by Ronald Bates) overwhelms the final movement and changes the ballet experience strikingly. Early in the movement the stage goes dark. The dancers are spotlighted so that first only Miss Kistler's face, then her arm, then his and her joined hands, and then their hands slipping from one another are spotlighted and they become isolated. The ballet and its denouement, carry an unexpectedly strong emotional impact. At other performances, this ballet has seemed less satisfying and the lighting changes more intrusion than technique. The magic of this ballet is very fragile. The final ballet of the evening, also by Balanchine, was Episodes, choreographed to four pieces of Anton von Webern's orchestral music, conducted by guest conductor Benjamin Pope. These four sections â€°Â¥Ã£ Symphony, Opus 21, Five Pieces, Opus 10, Concerto, Opus 24, and von Webern's orchestration of the Ricercata in Six Voices from Bach's "Musical Offering" - are what remain of a collaborative choreographic exercise with Martha Graham, whose work was originally performed by her own company alongside City Ballet. The dances are quite different from one another but all focus on isolating gestures and sequences in the dance, a reflection of von Webern's musical aesthetic. This ballet is the very stuff of New York City Ballet technique and style. Teresa Reichlen and Jason Fowler were especially brilliant in their pas de deux, Five Pieces, Opus 10. This choreography came as a gift to them â€°Â¥Ã£ perfect for their precise technique and flawless timing. And the final piece of the four, the Ricercataâ€°Â¥Ã combined Bach's rich music and von Webern's orchestral choices for musical dialog with an almost martial, ordered rank-on-rank corps backing Sara Mearns and Charles Askegard's pas de deux, an outstanding performance to close this evening of living archive.